LAS VEGAS, NV (KTRK) -- A Las Vegas restaurant is having some fun with the public about a burglary by posting surveillance video of the crooks in action with funny music and comments about their "weak" performance. 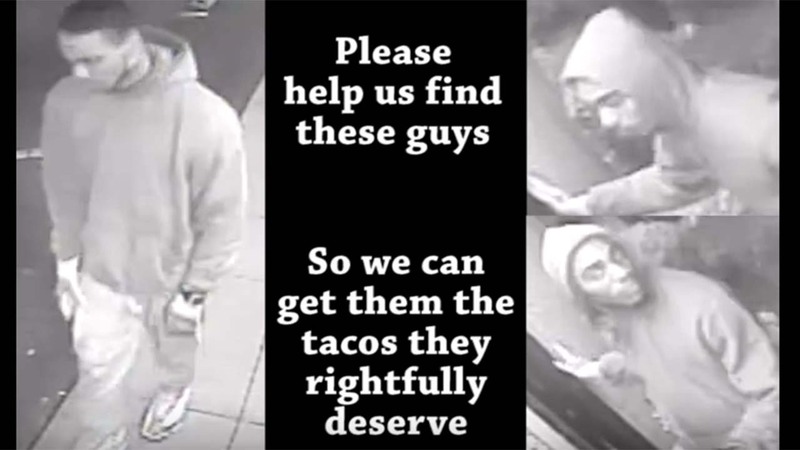 The Frijoles & Frescas Grilled Tacos restaurant shows the crooks breaking in with a rock and, as the humorous commentary points out, the burglars apparently are just looking for tacos. Over video of their food, the restaurant adds, "We take full responsibility for our tacos cause people to do." However, it really looks like the bad guys are out for cash as they smash a cash register. It's unclear whether they got away with any money. The burglary happened on December 16 around 3:30am in the 7000 block of W. Charleston Boulevard. If you have any information, you're asked to call Crime Stoppers in Las Vegas at 702-385-5555.